The new Mac Pro should give musicians the power they crave. Apple has launched a new version of its flagship Mac Pro. 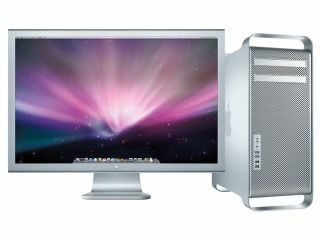 Replete with eight processor cores, this is the fastest Mac ever released. The new machine features a pair of Intel's 45 nanometer Quad-Core Xeon processors running at speeds of up to 3.2GHz. As a result, Apple is claiming that the updated Mac Pro can deliver up to twice the performance of its hardly-sluggish predecessor. All Mac Pros now come with an ATI Radeon HD 2600 XT graphics card with 256MB of memory. The expansion potential of the machine has been enhanced, too: you can now have up to 4TB of internal storage and install up to 32GB of RAM. Inside the tower you'll find one PCI Express 2.0 slot and two PCI Express slots, while external devices can be connected on the front and back of the case. The new Mac Pro is available now. Prices vary according to spec, but the standard model costs $2799/£1749. You can find out more or (if you're feeling flush) order a Mac Pro on the Apple website.